Unlike the dramatic increases in hard drive storage required during the personal computer era, modern-day mobile devices are dependent more on cloud-based storage than they are on local device storage. And given that you can’t upgrade the amount of storage on iOS devices, the decision as to what size device to buy becomes equally as important as which monthly data rate plan to use. Lets face it: even 128GB is not all that much space, especially when trying to use an iOS device as a replacement for a personal computer. If you’re taking photos of a special event or needing to open and edit an important document from a colleague or client, you need to have enough free space on your device to do so. Pushing everything up into the cloud can both increase your monthly bandwidth utilization as well as decrease your overall performance, as download speeds can vary from location to location. Thankfully, striking a balance between on device storage, monthly data usage and download speeds can be easy if you know where to look. Device Local Storage – Apps can take up space on your device; some apps more than others. To see which apps are taking up the most local storage on your device, go to the General > Usage > Manage Storage section located under the heading Storage. Here you will see a list of apps ranked by how much on device storage each is taking up. Drilling into each app’s information, you can see how much space is taken up by the app itself, and how much space is being taken up by the data on the device that the app uses. While the size of the app does affect the initial download, it is the ongoing data usage you need to pay attention to. As an example, the documents stored on the device for Pages, Keynote and Numbers will be listed separately from the size of the app when it was downloaded from the app store. Apps that take up a lot of local storage may need to be managed more closely if you don’t want to run out of free space. iCloud Remote Storage – Another number to keep track of is how much of your data is being stored in iCloud. App developers enable iCloud data storage in an effort to make the documents and information used by your apps accessible from multiple devices. This ease of use, or the sharing of documents between devices, is referred to as continuity. 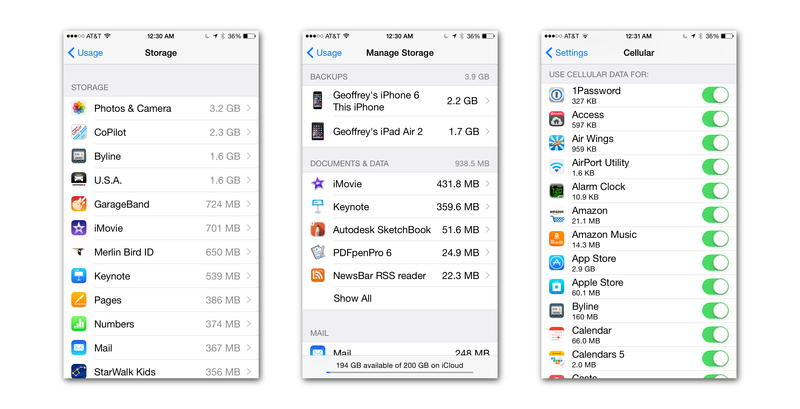 Go to General > Usage > Manage Storage located under the heading iCloud to see how much iCloud storage your apps are using. This app list is also ranked by most to least space used. Keep track of which apps are using the most iCloud storage, as they are likely the ones that are using up a good chunk of your monthly data plan. Cellular Data Usage – The apps at the top of both lists — the ones that use the most on device storage as well as the apps the store the most data in iCloud — are likely the apps that are using up the majority of your monthly data plan. To see how much data each app is using, go to the Cellular section of the Settings app. This is also where you can disable individual apps form using Cellular Data all together. This list shows you how much of your cellular data plan each app is consuming. Unfortunately the list is sorted alphabetically, not from most to least as the other lists are sorted. Turning off cellular data for a specific app will force it to use only a WiFi connection when syncing or accessing data. OOKLA Speedtest.net – If you do happen to access most if not all of your data remotely, then knowing what your internet speed is at the locations you are at the most often can be important. 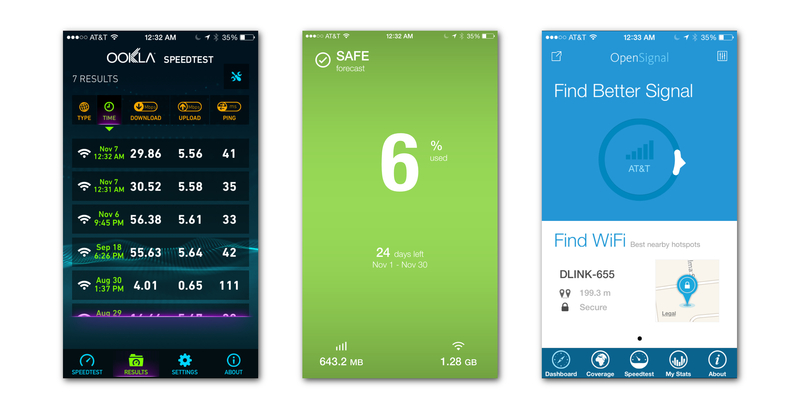 Speedtest.net Mobile Speed Test (Free, Universal) is an app that will do just that. As more and more apps use your iCloud Drive, you will notice a slowdown in performance of the app. Speed Test will measure your Ping rate as well as your Download and Upload speeds. You want lower ping rates and higher upload and download speeds. The app will keep track of the date, time and location of each test as well as if the test was conducted over a cellular or Wi-Fi connection. That way you can see when and where your connection to the internet is the fastest and perhaps plan on doing most of your syncing or data transfers based on your location. Data Man – Sometimes turning off cellular data is just not practical. You may however want to be alerted when you are getting close to your monthly data limits. DataMan Pro ($4.99 iPhone, $4.99 iPad) will allow you to set your billing cycle and track your data usage in real-time. You can even set up alerts to tell you when you are getting close to your monthly limits. This is also a great tool to use if you are thinking about switching plans and wanted to see exactly how much data you use each month before switching. It now has a Today Widget for the Notification Screen that will keep you up to date with how much data you have been using. OpenSignal – Being alerted that you are getting close to your monthly data rate limit is nice, but what do you do about it? OpenSignal (Free, iPhone) adds the ability to help you locate nearby Wi-Fi access points. This can be useful if you are looking for a way to use Wi-Fi rather than your cellular data plan. By accessing a database of known Wi-Fi access points, it can actually point you directly towards the source of a Wi-Fi signal. Its real value however lines in its NetworkRank feature. With it you can see a comparison of speed test results comprised by other users in your local area. It will help you identify which carrier has the fastest download speeds at locations that you are at the most. Thanks, but when I ungraded to iOS8, my iPad told me that the size was too large for the space remaining on my wife’s 16GB iPad. So I transferred photos to my Mac Pro and deleted them from the iPad. Still not enough room, so I deleted National Geographic which stored ALL the past issues on the iPad (lame!). Now I wish I had not upgraded for Safari is now so S-L-O-W. Perfect timing, thanks for this great information.